As the complexities of small business digital marketing continue to grow, the number of marketing technologies are also doubling each and every year. The escalating requirements to stay on top of constant marketing channel and platform changes, as well as changes within marketing channels, has become exceedingly difficult for most small business owners. The question is, are small companies able to handle and adapt to marketing requirements and maintain, then increase their local marketing results? The answer to increasingly complex marketing requirements for small business may be found in a recent study of over 1,000 small business owners. But it isn’t as simple of an answer as many might have hoped. The more complexity that is introduced within technology and marketing, means that there are significantly more challenges small business owners have to overcome to get results online. The research shows that nearly 47% of small business owners are attempting to handle their marketing by themselves. This number can’t be understated and should stand out like a sore thumb. It is likely the largest obstacle facing your local business success today. If half of all small business owners are doing their own marketing in an increasingly more intricate and detailed digital marketing environment, we can assure you that few of them are currently able to attain real results from their efforts and even fewer will in the future. Small business owners have two main things that they can utilize to make their local business marketing successful. They are time and knowledge. Of these two, there is nothing more important than a business owners time. A small business owners time cannot be expanded, scaled or carried over to another day. As a small business owner, your time must be utilized in the most efficient ways and on the most valuable activities that only you can do. When your time is spent on managing your small business marketing, you are sacrificing time that could be better spent on the things within your business that require you, your expertise, your leadership and knowledge. The things that Add to that, the continual changes to search, social media, content marketing and numerous other channels that change daily, and you end up with a substantial problem. Almost 1/5 of small business owners do not plan to use digital marketing at all this year. What’s worse is that almost 50% of small business owners are struggling to track their marketing investment and don’t even know whether they’re marketing effectively or not. Could it get even worse for small business marketers? Indeed it can and does. 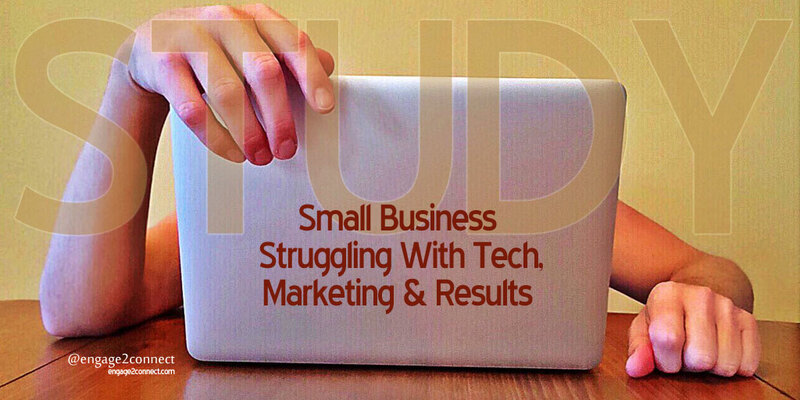 In fact, 14% surveyed stated that they KNOW they aren’t being effective with their small business digital marketing. What is it that is said about repeatedly doing the same thing, but expecting a different result???? management (CRM) applications to effectively manage it. Furthermore, 45% of small business owners don’t have an email list that customers can opt into and only 20% are using email marketing services and technologies to market to their small business lists. Small business owners must ensure they are building, managing and utilizing their customer lists in ways that deliver the highest returns. Technology, applications and software are now just as important for small business marketing as strategy, content and consistency. In order to be effective and efficient, local business owners need to utilize marketing technology to maximize their efforts. With literally thousands of digital marketing applications and platforms, it requires experience to get the strategy and execution right across multiple marketing channels. Currently just 41% of small business owners are using only 1-2 software applications in their marketing, and only 26 percent use 3-4. Believe it or not, managing all of the required elements of an effective small business digital marketing program requires more than that. In fact, upwards of 6-7 marketing technologies and applications are at the lowest required levels to ensure your local marketing is actually going to be seen and get results. Additional survey data by Infusionsoft.com and Leadpages.net shows that 50% of small businesses will be investing more in their website and increasing their online ad budget to primarily increase local traffic, leads and exposure. Many stated that they were going to focus on digital marketing, content and advertising in order to drive sales, brand awareness and promote their information. The point here is that your local competition is ramping up their digital footprint and you will need to as well. Small business owners should be looking to make substantial investment in their digital marketing efforts that redirect marketing budget, time and resources properly. This fact is supported within the research used to put this post together and ultimately shows that most small business owners are looking to digital marketing in order to meet goals of driving sales and revenue, acquiring NEW customers, generating leads and keeping their existing customers. Small business marketing budget focus is also looking to digital as the primary investment direction. In fact, the top four areas SMB’s are focusing additional spending on are their website, digital advertising, social media and email marketing. These represent only the minimum requirements for the average small business marketing, yet business owners are only now making it a real focus. Additional components of content creation, content marketing, strategic search and inbound marketing channels must also be deployed if their website, social and other digital marketing efforts are going to be optimized and generate measurable results. Digital marketing technology can certainly help small business be more effective online, but it is only as good as the marketing strategy that is being executed while using the software. Without a good understanding of what works, the required volumes and how to take advantage of multi-channel marketing online, small business owners may select the right marketing applications and platforms, yet still not see a significant change in results. This should be a huge caution to small business owners and point them toward marketing partnerships that can help.